The new Geiger-mode LiDAR technology allows for collections on a larger scale than previously possible. All of this is accomplished faster than traditional LiDAR, at higher-point density and at an affordable price. 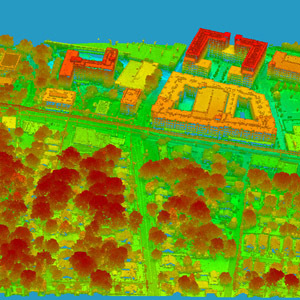 We can assist with this form of LiDAR, whether you need point cloud data to do your own analysis or want us to deliver a finished data product so you can make better decisions. For utility providers, Geiger-mode LiDAR can be used for full system-wide asset management and engineering, including transmission, distribution, as well as generation and substation infrastructure. Geiger-mode LiDAR can be used to manage vegetation encroachment on power lines. Manual methods of surveying are effective, but expensive and time-consuming. Linear LiDAR collects provide a good alternative to manual methods, but can also be cost prohibitive if you want to collect data on large portions of your corridors. With Geiger-mode LiDAR, large collections can be accomplished quickly and at a lower cost per linear mile than traditional LiDAR — a more precise view of where vegetation mitigation is needed. Geiger-mode LiDAR can be used to identify your community’s flood risk with highly accurate flood plain mapping. Our data and products can tell you whether certain areas are in high-risk zones under certain conditions. Changing weather patterns, erosion, and development can affect floodplain boundaries, so up-to-date data is essential for communities to determine flood hazards. Geiger-mode LiDAR data and products can give you the advanced warning you need to mitigate risks, warn population centers, and deploy assets for rescue. Oil and Gas operations are often spread out over large areas of varied terrain. Surveying this land can be difficult due to terrain accessibility and conditions, not to mention that it’s expensive and time consuming. Geiger-mode LiDAR offers companies in the oil and gas industry to collect data over large areas quickly and affordably. Our elevation products will enable you to make smart business decisions about the most cost-effective, efficient and safest placement of wells, roads and pads. Mitigating risk and serving your customers are two of the biggest requirements you face as an insurer. Sometimes it is difficult to achieve both aims simultaneously. Geiger-mode LiDAR is a cost-effective way to collect incredibly accurate inventories of building and property conditions over large areas before claims are made. Having this inventory catalog will not only help reduce fraud in the event of a loss, plus you’ll be able to serve your customers more reliably and with faster claim payments since you’ll know exactly what was damaged and how much it will cost to repair or replace.